One of the advantages of living in Malta is easy and fast access to a lot of vibrant cities. We can just pick a city and get there quickly and cheaply. Three days in Barcelona was just enough time to see and do the city’s greatest attractions. Having the reputation of one of the most vibrant and colourful cities in Europe, Barcelona surely deserves its role as the capital of Catalonia. I believe that in Barcelona you get the opportunity to truly understand the true meaning behind the word Mediterranean. One might ask why, and rightly so. Some of the reasons why Barcelona screams Mediterranean is the climate, food, vibe, culture, history and above all its personality. This is the city where you should let loose, drink cocktails, dance and embrace all the magic that will make you fall in love with the city of Barcelona. Get away from routine and experience Barcelona, a city full of character and packed with lively bars, exclusive restaurants. Barcelona has the perfect size: it’s not too small or too big. What I love about this city is that you can walk from one landmark to another, bike or make use of the efficient public transport. Public transport are the quickest, simplest and most convenient way of getting around in Barcelona. Taxis are also popular, these can be easily identified by their yellow and black livery. The green light on the taxi indicates its availability. Everything is within reach, which makes it an ideal city break. Barcelona is a dream destination for all foodies out there. No trip to Barcelona would be complete without the Paella. This rice and sea food dish is served for important celebrations and a lot of family occasion. The Pa amb Tomaquet, literally translated to bread with tomato, is so simple yet full of flavour and can be served with literally every meal. It’s basically bread-rubbed with garlic and the juice of a tomato and seasoned with olive oil, salt, and pepper. This is a must try, and don’t worry, you can find it everywhere. And I can’t write about food in Barcelona and not mention the Jamon Iberico. One of the highlights of our trip was when Sebastian surprised me with a visit to the Jamon Experience. A little piece of heaven right in the heart of Barcelona. We learnt so much about this delicatessen that Spanish people have been making for more than two thousand years. Oh boy, so delicious! Whether you are into Spanish, Italian, Japanese or Chinese food, in Barcelona you will surely find something that will tickle your taste buds. The restaurant scene in Barcelona is awesome. Barcelona is one of the world’s best cities when it comes to eating and drinking. In fact, in Barcelona there are more than twenty Michelin Star restaurants. On our first night in Barcelona we had dinner at El Nacional. El Nacional, is unlike any other restaurant we have ever been too. The concept is innovative, the decor is stunning, and the food was out of this world. Definitely one of the most enjoyable dining experiences abroad. This restaurant includes several different eating areas defined by specialty and graced by unusual and beautiful presentation. The service was top- notch and the waiter was very knowledgeable, he answered all of our questions without any hesitation. If you want a fancy restaurant in Barcelona, go to Ikibana Restaurant. It is a very posh place so expect a crowd of well-dressed people and a line to get in at peak times. This can be easily avoided if you make a reservation. The restaurant is well decorated and very stylish. Loved the ambiance but what I fell in love with was the food. I don’t like sushi so they recommended the Kobe beef. While it is expensive, it is unique and just melts in your mouth. If you go to Barcelona and don’t visit the Sagrada Familia, did you even really go? This Basilica is one of the most gorgeous cathedral that I have ever seen in my life. The design, the detail, the history, the architecture, the play of light and glass, and statues all make this Basilica a unique place to visit. What intrigued me the most is that this masterpiece is still not completed. We bought the tickets in advance, as advised by several friends who visited recently. The Basilica is one of the main tourist attractions, so be prepared for the crowds but worth every penny and minute. Barcelona has no shortage of beautiful art galleries or museums , but one of my favourite spots in Barcelona is Park Guell. Park Guell is a public park composed of stunning gardens and architectonic elements located on Carmel Hill. In my opinion this Park is a must for anyone to hit all Gaudi’s attraction! It’s not just a park, it’s Gaudi’s park. We spent a full morning viewing the gardens, Gaudi’s home and some of his art work. We still have a lot left to see. Picasso Museum in Barcelona is home to one of the most comprehensive collections of artwork by the great Picasso. With more than 4000 works exhibited by the painter, this museum has to be one of the most complete collections of his work. Personally, I felt that I learnt so much about his development as an artist. We took the audio tour which really enhanced the experience and gave us a better insight about his life. It was one of the most art enlightening experiences ever. We were quite tired after a lot of sightseeing but we decided that we should try and squeeze in something else before we go to the hotel and rest. After checking some expert reviews we decided to try and get to Montjuic…. and we definitely don’t regret it. The views are breathtaking. We started the journey right at the top of the mountain. From the castle we were able to get some of the best views of the Barcelona Harbour. There is also a grand park, which is ideal for a stroll. We kept walking (despite feeling tired) and found a museum dedicated to another brilliant artist: Juan Miro. Miro’s museum, one of the city’s most important artist, features work from different stages of his life. Along with Picasso and Dali, Miro, is one of the most universal Spanish artists. Important notice: Please stop reading if you are hungry! La Boqueria is one of the largest markets and most popular landmarks in Barcelona. We can assure all food lovers out there that at La Boqueria you will find a very diverse selection of high quality food. A market to feast your senses. A visit to the market is an experience in its own right. Here you can find fruit stalls, meat stalls and much more. Whether you buy, have a meal or simply take a look, you are guaranteed to have a memorable experience. If you want to discover more of the city and experience this vibrant city I suggest you visit it as soon as possible. 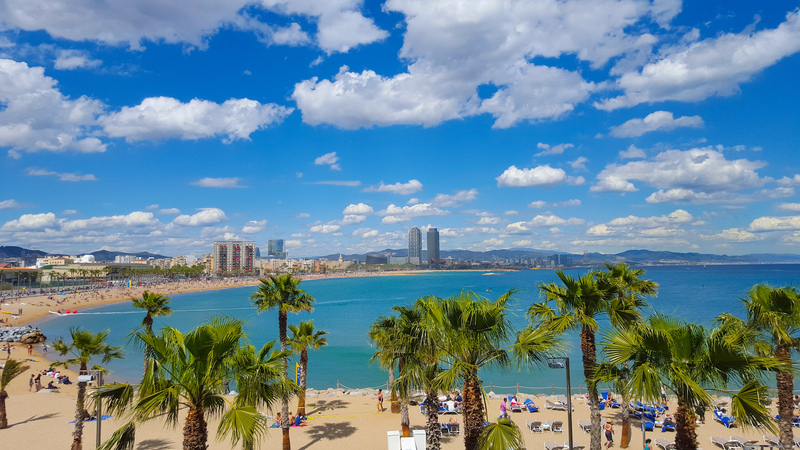 Barcelona is an enchanting city with its rich cultural, mouthwatering food and vibrant nightlife.